The Perth Mint of Australia brings several new silver coins to the collector market this month with products covering everything from iconic landmarks to night sky phenomena. Three silver coins now available from the Perth Mint include the 2013 Sydney Opera House 10 oz Silver Proof Coin, the 2013 Australian Opal Kangaroo Silver Proof Coin and the 2013 Antarctic Territory Aurora Australis Silver Proof Coin. Each is composed of 99.9% pure silver. 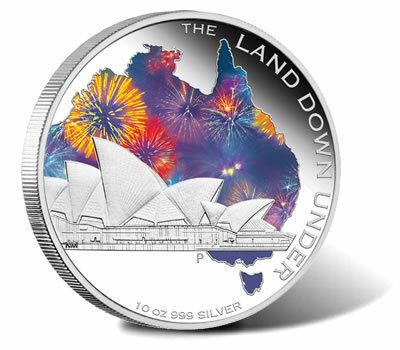 The 2013 Sydney Opera House 10 oz Silver Proof Coin makes its debut one month after the release of a smaller version struck from one ounce of silver. Like it, the 10 oz coin features a colored reverse design emblematic of the Sydney Opera House located at Bennelong Point on Sydney Harbour in New South Wales, Australia. Above the opera house, an outline of the Australian continent is found. The map-shaped image is filled with colorful fireworks. Perth Mint artist Natasha Muhl is responsible for the design. Along with last month’s similar release, this coin is offered as part of "The Land Down Under" series showcasing aspects of Australian life and history. Future coins of the program will feature reverse designs of Didgeridoo, Captain Cook and Surfing. Current pricing of the coin is AUS $863.64, but that is subject to change based on market conditions. Offered as the third release in the Perth Mint’s Australian Opal series is the 2013 Australian Opal Kangaroo Silver Proof Coin. Found on the reverse of the coin is a design showcasing one of Australia’s iconic creatures, the kangaroo. The marsupial is on an inner panel of pure Australian opal. Surrounding the opal are representations of Sturts Desert Pea leaves and blossoms, a crescent moon and the Southern Cross. The reverse was designed by Perth Mint artist Aleysha Howarth. 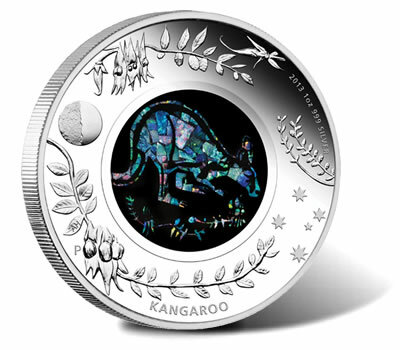 As of this posting, the price of the Opal Kangaroo coin is AUS $114.55. The Perth Mint’s Australian Antarctic Territory Series now includes ten different strikes with the release of the 2013 Australian Antarctic Aurora Australis Silver Proof Coin. The series debuted in 2004 with several of the coins selling out status. Shown on the reverse is an outline of Antarctica. Inside the outline, a human observer is gazing at the colored representation of the Aurora Australis, a nighttime phenomenon seen in the sky in the Southern hemisphere. Perth Mint artist Wade Robinson is the designer. 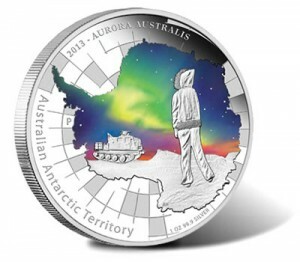 Pricing of the Aurora Australis coin is AUS $94.55. However, as with all precious metal coins from the Perth Mint, that pricing is subject to change based on market conditions. Each of the three silver coins is struck as legal tender of Australia under the Australian Currency Act of 1965. The ten ounce Sydney Opera House Coin features a face value of AUS $10 with the other two silver coins having a face value of $1. All three may be ordered directly from the Perth Mint website at www.perthmint.com.au.